The most satisfying thing about cooking is enjoying the many tantalizing aromas that accompany a meal in the making. 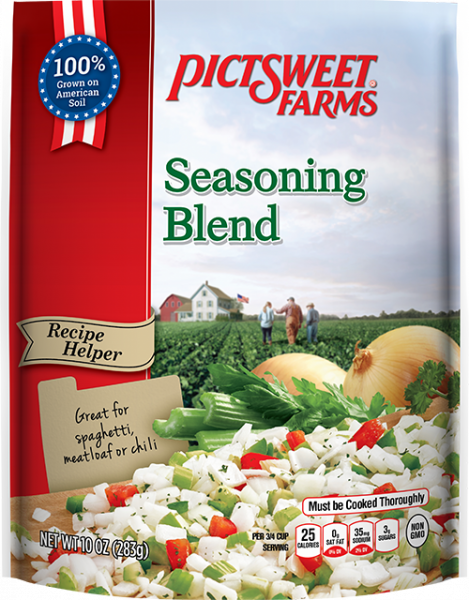 And those are usually focused on the delightful tastes we’ve put together right here–sweet onions, crisp celery, green and red peppers and a touch of parsley flakes. Try it in any of your favorite recipes. We’ve done all the chopping and weeping over the onions. All you have to do is enjoy the mouthwatering results. Heat 2 Tbsp. oil in skillet on high. Pour package of frozen vegetables into skillet and sauté for 4 minutes. Onions, Celery, Green & Red Peppers, Parsley Flakes.